Real people. Real moments. Real emotions. It had been a great morning. The father of the bride is a builder and he had been entertaining everyone in the girls’ room with his dry sense of humour. James the hairstylist was superb in making up the comedy double act and it all made everyone feel so relaxed. I never for one minute imagined what was to follow later on that morning. The moment eventually came for the father of the bride to leave the room to get into his suit. The bride nervously slipped into the dress with the help of her mum and Rochelle – the calmly collected makeup artist who had seen it all hundreds of times before. Final adjustments were made to the dress, the hair & the lipstick. On went the veil. Eventually, there was a knock at the door – it was the bride’s father. He’d been told to come back to the room to see his daughter in her wedding dress. What happened next was beautiful, totally heart-wrenching and had me & the videographer I was working with sweaty-eyed behind our cameras. It’s what’s preserved forever, in the form of the picture above. The bride and her father embracing each other, the tears freely flowing, the pride clearly showing. To the bride – and her family – this moment is absolutely priceless. Looking For A Wedding Photographer Who Can Actually ‘Capture’ The Real Story Of Your Day Instead Of Contriving It? Forget all the posed portraits and never-ending detail shots you’re used to seeing from a typical wedding photographer. You’re looking for a wedding photographer who specialises in raw, emotionally-charged photographs that capture the real story of your wedding from start to finish. So powerful they can bring you back with just a glance. Your wedding is a once-in-a-lifetime event. A truly special moment in time. A special moment that you’ll want to return to again and again over the course of your life. In addition, you’ll want your children and grandchildren to be able to relive it with you in the years to come. 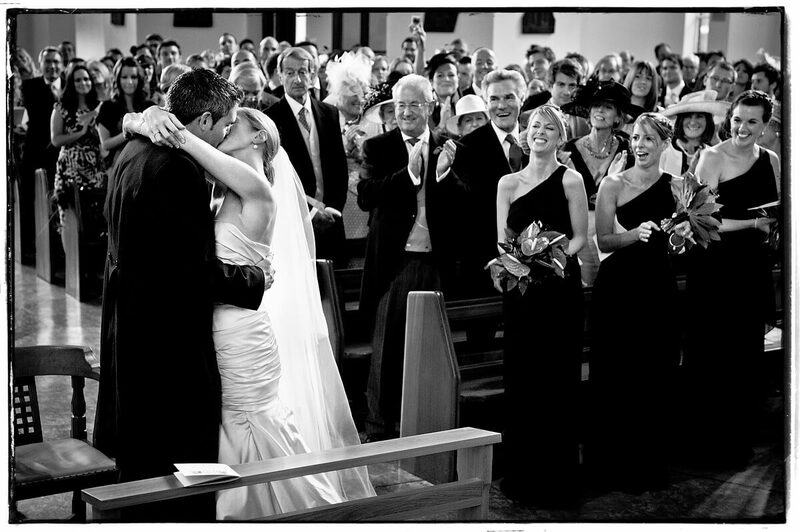 Therefore you deserve an award-winning wedding photographer who can actually document that priceless moment for you. Tangible memories of real people and raw emotions, not contrived or staged moments. Discover wedding photography without ego. You’ve been to lots of friends weddings and it seems that most other photographers take charge and direct the day. They’ll take endless portraits that are highly-staged and contrived. They’ll fill up a wedding album with pictures of the decor and the details. Because those pictures mean more to their portfolio than they do to their couples. That’s why my unique approach is to capture the raw and real moments of your wedding. My “fly-on-the-wall” style that makes most people think I’m actually a guest of the bride and groom and not the wedding photographer. It’s my photojournalistic approach, along with my images and customer service that’s won me a variety of regional and international awards over the course of my professional career. Natural Moments. Raw Emotions. Real Personalities. You want a photographer to help you document this special moment in time. To preserve your story so that it can be cherished and treasured for generations by family and friends alike. You want to be able to share the real story of your wedding — with the people, moments, and most of all, the feelings that came along with it. Not something that’s inaccurate, false, contrived, staged or merely posed. You want a story of the day that enables you to revisit the entire experience. You want to feel every one of those precious moments come flooding back to you in a heartbeat. Most of all, the butterflies, the expectations, the suspense, the tears, joy and laughter, and of course, the loved ones who were present then, but might not be around today. So, you’re looking for a special way to capture this once-in-a-lifetime moment (and a wedding photographer who does more than stage the day and want to be the centre of attention). Click the ‘get in touch’ button below right now to get in touch with me and find out how we can work together. “It Seems Like Most Other Photographers Think That The Most Important Thing To Photograph Is the Decor And Details. I Think More Deeply Than That. "Ian, thank you so so much, we absolutely LOVE them – there certainly was a lot of laughter and a lot of tears and you’ve captured it beautifully! I have found working today very difficult, as it’s much more fun to look at the pictures! We look forward to decorating our new house with your work!" THE RIGHT FIT? Think you might have stumbled across the wedding photographer for you? Here are five answers to five questions that you might have in your search to find the right photographer. CONTACT ME NOW Want a relaxed, no-obligation consultation in person or over video chat to tell me about your plans for the day, your expectations regarding photography and to learn more about how I work?